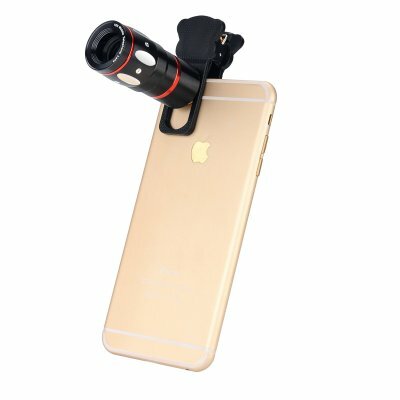 Successfully Added Universal 4-in-1 Smartphone Lens Kit - Fisheye Lens, Macro Lens, X10 Telescopic Lens, Wide Angle Lens (Black) to your Shopping Cart. The 4-in-1 smartphone lens kit is a comprehensive and versatile tool to enhance your mobile photography. Get just the effect you are looking for by using a macro, fisheye, wide angle or x10 telescopic lens. Use the lenses with any smartphone, Android or iOS, thanks to the universal holder. Lightweight and compact any lens in the kit can be mounted within seconds and fit in the palm of your hand. These days a smartphone is probably the number one device we use when it comes to taking a picture. A quick selfie, a landscape shot, a picture of your morning coffee or a whole album of events from your recent vacation – your smartphone can do it all and help you instantly spread the word on social media. Whatever it is you are after when it comes to mobile photography, one thing is clear – you want your pictures to look good, and even better than good. With the 4-in-1 lens kit for smartphones, you will not only be able to significantly increase the quality of your mobile pics, but also get all the desired effects you were looking for. The kit comes with 4 lenses: a macro lens, a wide angle lens, a fisheye lens and a X10 telescopic lens. A Macro Lens will help you get the most detail out of your pictures and is perfect for close-ups and product shots, when every curve and texture change matters. A Wide Angle Lens will let you get more of the background into the shot – telling the complete story behind every picture you take and not missing out on the beauty of the surrounding landscape. A Fisheye Lens is the perfect choice if you are looking for panoramic imagery and is basically an ultra wide angle lens. Turn to it when your shot needs to cover an extensive area. A X10 Telescopic lens will give your mobile pics a 10X magnification boost, while optimizing and even enhancing image quality. With the 4-in-1 smartphone lens kit you will have yourself a versatile tool for mobile photography that can fit right in the palm of your hand. Capture anything you want with the effect you want simply by using your smartphone cam. Any lens in the kit is easily mountable within seconds and will serve you long and well. The 4-in-1 smartphone lens kit comes with 12 months warranty. Brought to you by the leader in electronic devices as well as wholesale smartphone lens kits, Chinavasion.. When you open it must be carefully. Inside the lens 3 pieces lens are not sticky.